August shaped-up to be a near-average month in terms of temperature for the Stateline. According to my math, we were 0.7 degrees above average. It probably felt like a cool month to a lot of folks, however, after going through the 5th hottest July on record! 10:40pm Update: Katia is now a Hurricane with 75mph maximum sustained winds, moving WNW at 20mph. It is still in the open waters of the Atlantic, well away from land. In addition to Tropical Storm Katia (which is now just 4mph shy of hurricane status), we continue to watch for development in the southeastern Gulf of Mexico. As Morning Meteorologist Candice King noted in an earlier post, an unorganized area of showers and storms to the northwest of Cuba bears watching. Although this area remains unorganized as of this writing due to strong wind shear, this could change tomorrow afternoon. This area of storms will encounter weaker wind shear at that time, which could allow it to develop into a tropical system. In fact, this area (shown in red with the above map) now has a HIGH probability of development according to the National Hurricane Center. We'll continue to watch what could become the next tropical storm in the Atlantic basin. Looking at the satellite imagery this morning and there are a couple interesting features that I want to point out. First, is a broad area of moisture centered in the Gulf of Mexico with a tropical wave in the northwest Caribbean Sea. Our weather computer models over the past 24 hours have wanted to develop an area of low pressure and actually move it into either the southeastern coast of Texas or Mexico by this weekend. While this probably won't turn into a tropical storm or hurricane, it would provide beneficial rainfall to southern Texas. As we know, folks there have been dealing with an exceptional drought all summer. Another reason to watch these two features closely is because if they were to develop into some sort of low pressure system, we might not see as much moisture return northward later this week and into the weekend. There are some differences, however, among model guidance as just to when, how fast and where these features track. A quicker movement/development would mean not a lot of moisture would become wrapped within the system but a slower development would yield more moisture and then more rainfall for parts of Texas. Something very interesting to monitor the next 48 hours. Either way, it looks like Texas may get some rain late Wednesday and into Thursday!! Tropical Storm Katia continues to spin in the Atlantic Ocean west of Africa's coast late this morning. Shear near the system has decreased some and Katia is becoming a little more organized as the storm moves west/northwest around 18 mph. Maximum sustained winds are 45 mph with a pressure of 1003 mb. A subtropical ridge currently sits to the north of Katia and will continue to help steer the system to the northwest into warmer waters where further strengthening is expected to take place. Katia could develop into the next major hurricane within a day or so. As of right now it looks like there won't be an impact on the US because a trough move move into the east coast later this week and should help keep it out to sea. Of course, this storm is several thousand miles away from the US coast line and the track will continue to be monitored over the next week. Skies will remain mostly cloudy today as an upper level disturbance moves out of the Plains and into the Midwest. The showers falling across Iowa should hold together long enough to make it further east into the Stateline later this afternoon. In fact, there are already a few light showers falling in Cedar Rapids, IA so counties along the Mississippi River may feel a rain drop or two later this morning. I do think a better chance for rain to move in will come this afternoon and evening, aided by the upper level disturbance but also an MCV (mesoscale convective vorticies) that has developed on the back edge of the storms near Lincoln, NE. Don't worry, though, the heat isn't going to return today. It's actually going to be a pretty nice afternoon with partly sunny skies and temperatures back in the upper 70s. Tuesday and Wednesday will be our 'transition days' as strong winds within the jet stream help to dig out a trough in the west but also build a ridge of high pressure further north into the Midwest and Great Lakes. A warm front will begin to move closer late in the day on Tuesday and into Wednesday keeping only a small storm chance going both days. By Thursday, the warm front will be to our north and with a breezy southwest wind the heat and humidity will have returned. Dew points will likely rise back into the upper 60s/low 70s and temperatures could very well top the low 90s for both Thursday and Friday. By late Friday or early Saturday (still a little too early to pin down) a pretty strong cold front will begin to move southeast across the Plains with the potential for a few stronger storms. Behind the front temperatures could fall into the middle and even low 70s by next Monday. High pressure over Minnesota will continue to be the main weather maker for the Stateline through Monday, and probably through the mid day hours on Tuesday. It will slip slowly to the southeast across the area toward Indiana by Monday night, and then on toward the east coast. A weak disturbance caused some light showers, and sprinkles across parts of the Stateline on Sunday evening. Those showers were moving southeast, and are expected to clear the area by 1 am leading to decreasing clouds overnight which will allow the skies to become mostly clear by late tonight. Temperatures will drop off into the middle 50s with light winds, and Monday will be mostly sunny with a high around 80 degrees. It will be mostly clear on Monday night, and by Tuesday more clouds will come into the picture, and there could be some widely scattered showers and thunderstorms in the afternoon. Scattered thunderstorms will continue on Tuesday night. On Wednesday skies will be partly cloudy, and a warm up will begin. By Thursday it will be very warm with a high in the upper 80's, and Friday it will be hot with temps rising into the low 90s. The heat will be short lived, however, with the next cool front moving into the area on Saturday along with a chance of showers and thunderstorms. Category 1 Hurricane Irene is churning off the Maryland coast with 80 mph sustained winds tonight. It is producing a coastal storm surge of between 4 and 5 feet as it moves toward the north northeast at 16 mph. The low lying coastal areas are especially vulnerable at times of high tides during the next 24 hours. The hurricane is also producing very heavy rains, and a corridor of 10 to 14 inch rainfalls will occur in a swath just inland of the storms track, so serious flooding will be a problem because those areas already had saturated soils before this storm came along. While the east coast has to deal with Irene, the Midwest is having fabulous weather. High pressure is sitting over northern Wisconsin, and the Upper Peninsula of Michigan tonight, and it will move very little the next 24 hours. Irene has jammed up the atmospheric air flow, and the high will have to wait until Irene moves off to the northeast. With the high dominating area weather, skies will be mostly clear, and a little on the cool side for the next couple of nights with lows in the middle to upper 50's. Daytime high temperatures will be in the upper 70's to around 80 degrees. Skies will be mostly sunny during the days through Monday when the high will shift southeast into Indiana by Monday evening, and kick loose into eastern Pennsylvania by Tuesday morning. That will allow a series of disturbances to move into the Stateline from the west. With the gulf of Mexico cut off, there will only be slight chances of showers and thunderstorms off and on from Tuesday through Wednesday night. On Thursday a stronger system to our west will drag a significant warm front though the area bringing heat and humidity back into the Stateline for Thursday and Friday. High temperatures both days will be in the upper 80s, and may reach 90 degrees on Friday. A cool front will approach the area on Friday bringing scattered showers and thunderstorms back into the forecast by Friday afternoon. There will be a good chance of showers and thunderstorms on Friday night and early Saturday ahead of the cool front. It will become mostly sunny and cooler on Saturday with an afternoon high in the upper 70s. A view from the International Space Station of Hurricane Irene yesterday before making landfall! Pretty cool if you ask me! According to NASA, mean sea level dropped by 6 mm in the last year. This may not sound like much, but it is a significant drop considering that sea level had been rising at an average rate of 3 mm per year over the last two decades. 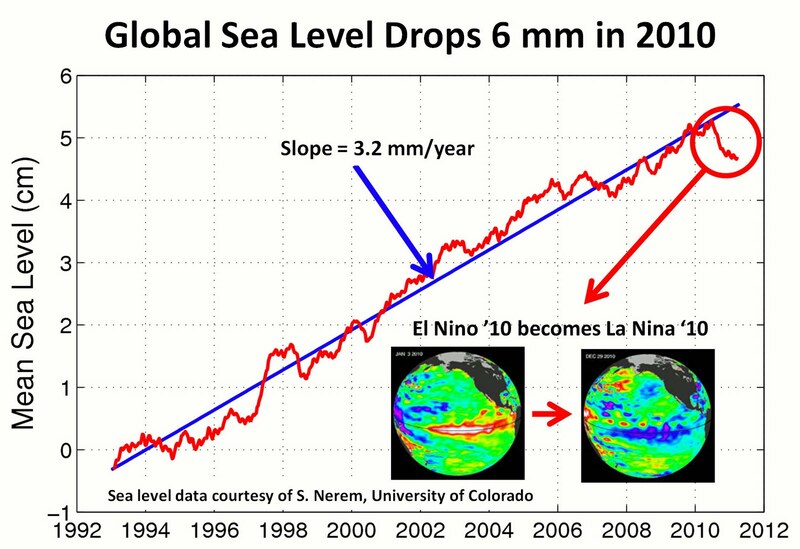 According to NASA, La Nina is the reason behind the drop in sea level. The La Nina Pattern that largely dominated over the last year deposited heavier than normal amounts of rainfall on the continents -- especially Australia and northern South America. However, other scientists believe the oceans may have cooled in the last year. Since cool water generally takes-up less volume than warm water, it can contribute to a drop in sea level as well. For more on this topic, click here. 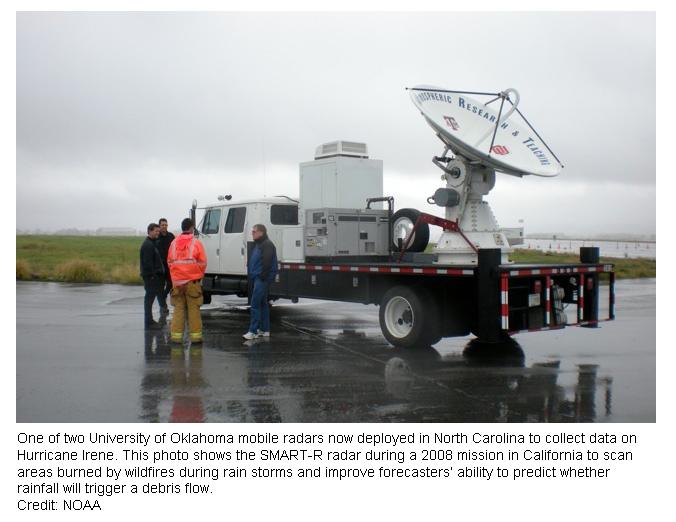 NOAA and University of Oklahoma researchers are in North Carolina to deploy two mobile radars and a state-of-the-art instrumented vehicle to intercept Hurricane Irene. They are joining research teams from across the United States to collect an unprecedented hurricane dataset to better understand these devastating storms and protect lives and property. 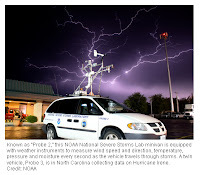 The team includes researchers from the NOAA National Severe Storms Laboratory, the University of Oklahoma (OU), and the NOAA Cooperative Institute for Mesoscale Meteorological Studies at OU. Hurricanes are notorious producers of torrential rain. This combined with fierce winds, driving water and waves onshore, can cause devastating flooding even many miles inland. Scientists will use the unique dataset from this storm to help improve techniques for estimating rainfall in extreme weather events, which will increase the accuracy of flood and flash flood forecasts and warnings. Researchers also want to understand severe turbulence and wind bursts in the hurricane near the ground to help set building code guidelines in hurricane prone areas. Both mobile radars from the University of Oklahoma are equipped with dual-polarization technology that provides more accurate estimates of precipitation type and amount. This will be the first hurricane for the National Science Foundation-funded Rapid Scan X-band dual polarized radar (RaXPOL), which is sensitive enough to detect cloud particles. The storm intercept Shared Mobile Atmospheric Research and Teaching radar (SMART-R 2) uses a different frequency and detects precipitation. Data from one of the mobile radars will be available online for public real-time viewing while it is gathering data: http://smartr.metr.ou.edu/smartr2/img. 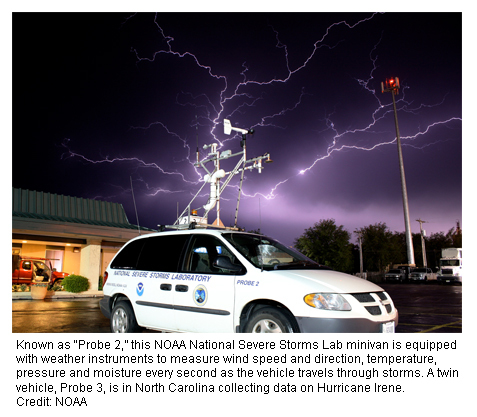 Researchers plan to compare mobile radar data with the NOAA National Weather Service NEXRAD radar in Newport/Morehead City, N.C., recently upgraded with dual-polarization technology. It will be the first time three radars transmitting at three different frequencies will be operating simultaneously to scan a land-falling hurricane. Since each radar reveals different features of the storm, researchers will be looking for new clues in the rainfall characteristics of hurricanes. In addition, a number of new weather instruments fixed to a vehicle will be tested during the deployment. Other teams will deploy a variety of sensitive weather instruments to measure clouds, size and speed of raindrops, infrared radiation, static electricity, turbulence, and wave surges. For their own safety, the NOAA/University of Oklahoma team will choose a site designed to withstand Category-5 hurricane storm surge and will anchor their vehicles. A SMART-R radar intercepted Tropical Storm Gabrielle in 2001, Hurricane Lilli in 2002, Hurricane Isabel in 2003 and Hurricane Frances in 2005. A mobile radar was also deployed during Hurricane Ike in 2008 and made the first dual-polarized scans of a hurricane eyewall. Data from NOAA and Air Force Reserve aircraft has suggested that the intensity of Irene is slightly lower; the winds have come down some but Irene is still a strong category two hurricane. Irene continues to spin over open waters and there have already been some effects from the storm felt along the coast of South Carolina this morning. The current forecast has not significantly changed and Irene is expected to pass near or even over the North Carolina coast tomorrow afternoon. Conditions will continue to deteriorate in North Carolina and the Mid-Atlantic today and by Saturday in the Northeast. Once Irene has passed over North Carolina shear is expected to increase from the southwest and the sea surface temperatures will gradually decrease. However, it is expected that Irene could reach New York City as a Category One hurricane by early Sunday morning. New York City has not had a hurricane this close since 1944! Hurricane Warnings have now been extended further northward as of this latest advisory. Even though Irene's winds have decreased some it's still a very large storm. Hurricane force winds extend 90 miles from the center of the storm while tropical storm force winds extend up to 290 miles from the center. Effects will be felt up and down the east coast from torrential rain, damaging winds and storm surge flooding. We'll continue to post updates on Irene as the weekend continues. We've enjoyed some fairly nice weather the past couple of weeks; comfortable temperatures and low humidity. While this upcoming weekend will feature near average temperatures and little rainfall, that may all be changing by this time next weekend. Very strong jet stream winds will come down from the Gulf of Alaska early next week causing a trough of low pressure to develop in the Pacific Northwest and the ridge that has been settled across the southern states to expand a little further east and north. This could come with a pretty good wind out of the southwest by the middle of the week which could bump temperatures close to 90° once again. However, the strong jet stream winds will move across the U.S/Canadian border causing a cold front to possibly drop through Saturday putting a temporary end to the heat. Of course, the timing of the front will probably change since it is a week away but it does look like it's going to get just a little warmer here. Mother Nature is ready to give up summer just yet. Earlier this week we had received a photo from one of our weather watchers in Oregon, Mary Montana, of a maple tree and the colors were already starting to change. She had wondered what might cause something like that so early in the season. Chief Meteorologist Ty Shesky talked a little about it in an earlier blog post. Another more plausible explanation is that the wet spring caused fungus to infect the tree. Two fungi species infect Norway maples and cause Verticillium wilt during wet springs. The leaves will turn color and fall in mid-August. As with human diseases, some trees are susceptible to the infection, while others are resistant. We had a wet spring this year. Also, aphids and sap-sucking beetles can cause maple trees to loose their leaves. These insects burrow into the bark. The tree in my photo has a lot of insect damage. Note the dead branches. For several years, this tree has lost its leaves early. All across the Stateline high school teams are gearing up for their first, of many, Friday night games. Tonight the Freeport Pretzels will host the Guilford Vikings as Freeport High School dedicates their new field and will be offering a special ticket price to spectators. The brand new state-of-the-art field installed over the summer at Freeport High School's stadium will be officially dedicated during a short ceremony at 6:30 PM this Friday night between the scheduled football games. The band will then lead the crowd in "On Freeport" as the FHS varsity football team takes the field season's to play the season's first home game. To mark this special occasion, for this game only, all spectators who arrive at Pretzel Stadium by 6:00 PM will save $1 per ticket. On August 26th then, entrance into the game before 6:00 will be $3 for adults, $2 for senior citizens, and $1 for students with their school IDs. Regular admission applies after 6:00 PM and to all future games at all entrance times. If you're planning on heading out to Pretzel Stadium, or any other are high school football game, temperatures will be in the middle 70s under partly cloudy skies. Should be a very nice night for some football! Also, don't forget to join WTVO's Sports Director Scott Leber and Weekend Sports Anchor Dan Hutchison for 'The Sports Connection' tonight as they break down the plays and give you scores and highlights of tonight's game. The forward speed and maximum sustained winds with Hurricane Irene have remained unchanged since 1pm CDT this afternoon. It continues to churn the waters of the Atlantic Ocean as a category-3 storm with 115 mph maximum sustained winds. It also still has a forward speed of 14 mph, except its movement has shifted closer to due north (it was moving northwesterly before). At left are the hurricane wind speed probabilities. A hurricane warning is in-effect for much of coastal North Carolina, and a hurricane watch is in-effect from the NC/Virginia border up through Sandy Hook, NJ. The outer banks of North Carolina along with several northeastern states could be directly impacted by Irene. Some parts of New York City may have to be evacuated. Earlier this week Jim Allsopp, Warning Coordination Meteorologist with the National Weather Service in Chicago, sent out this email to all meteorologists in the Rockford and Chicago areas stating that many lessons can be learned from what happened at the Indiana State Fair a couple weekends ago. He states this tragedy was, for the most part, very avoidable and stresses the importance of having a severe weather preparedness plan in place for outdoor venues. I'm sure most of you have heard about the tragic event at the Indiana State Fair the weekend before last, when a concert stage collapsed, crushing dozens of people and killing six. This was not a freak occurrence. In fact, there have been three weather related stage collapses this summer (Cheap Trick in Ottawa, and Chicago band The Smith Wessons in Belgium). Wind engineers and storm damage experts will be investigating the Indiana event, but preliminary estimates of wind speeds were in the range of 50 to 70 mph. Preliminary reports also questioned the expected timing given in the Severe Thunderstorm Warning. But the fact is that a Severe Thunderstorm Watch was in effect at 600 PM, almost 3 hours before the storm hit, and a Severe Thunderstorm Warning was issued at 839 PM, about 10 minutes before the storm hit. The line of storms was visible on radar well before the storm hit. This tragedy was avoidable! This time of year there are many outdoor fairs, festivals, concerts and sporting events. There are three main players in protecting people from weather disasters at large outdoor events - the NWS, the event organizer and the emergency management community. I recently sent an email out to the emergency management community encouraging them to be proactive in working with event organizers in their counties and communities to make sure there is a severe weather plan in place. We have done severe weather preparedness workshops for large event venues in the past, and we will be developing a large event severe weather preparedness guide to post on our web page soon. I will be giving a presentation at the Illinois Emergency Management Agency Conference in Springfield next month on severe weather planning for large venues and schools. We also encourage large event operators to become StormReady. Monitor - have someone monitor radar, and have a NOAA Weather Radio. Have a secondary method to receive warnings in case NOAA Weather Radio fails. Have trained weather spotters at the event if storms threaten. Act - If a watch is in effect or storms are approaching, review the plan and be prepared to act quickly. If a warning is issued, or if severe weather is reported, don't hesitate - take action! Severe thunderstorm warnings are issued for storms that produce winds in excess of 58 mph. Weak structures such as tents, canopies, scaffolding, amusement rides may be vulnerable in winds of 30 to 50 mph. Lightning is also a major storm-related killer. There are no warnings issued for lightning or non-severe wind gusts. (However, we do issue Special Weather Statements for near-severe storms) Therefore, all thunderstorms are potentially dangerous to people outdoors and should be taken seriously. But there is also a fourth component to large event preparedness - and that is with the individual event-goers. The public. And this is where you can help get the message out, as you have way more contact with the public than we do at NWS. Everyone has to take some personal responsibility when heading out to a ballgame, a festival, or a concert. People should always check the forecast before they head out. If there is a threat of thunderstorms, people should monitor the weather while they are out. Many people have a mobile device with internet access. Most of you in TV weather have web pages or blogs and some of you frequently post updates on Twitter or Facebook. 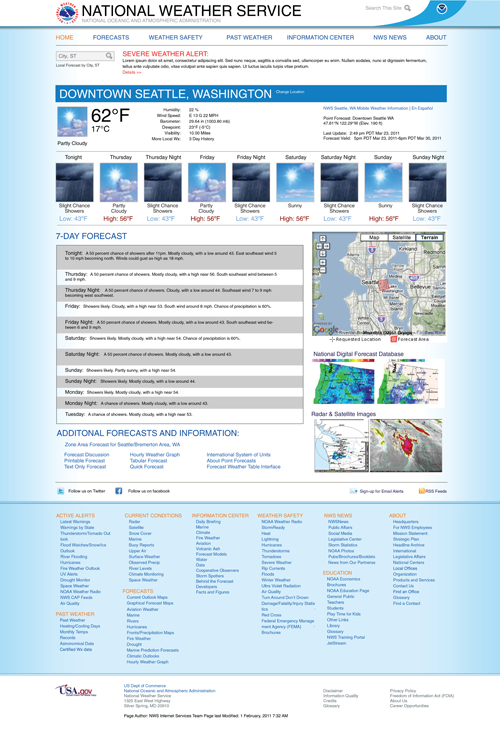 Radar is available online and there are tons of weather apps and methods of receiving NWS warning alerts to cell phones. People can't always count on the event organizer to warn them of impending storms. They have to take personal responsibility to look out for themselves. Also, people should also check out their surroundings when they arrive at an event and ask themselves, "Where could I go to find shelter if the weather gets bad? Am I sitting in a dangerous location near something that could become airborne or near something that could blow down?" We appreciate everything you do to help educate the public. Vegetation in the mid-latitudes change their color in the Fall due to cooler temperatures and less daylight. Across the Stateline area, peak color usually doesn't occur until mid-October. Although, some trees obviously start a little bit early! 6:30pm Update Irene has strengthened further... It now has maximum sustained winds of 120 mph an a minimum central pressure of 954mb. It is currently moving toward the northwest at 12 mph. It is located 215 miles southeast of Nassau, Bahamas. Watches and warnings with the latest advisory remained unchanged. According to the National Hurricane Center the eye of Irene is headed for the Crooked and Acklins Islands. Hurricane Irene was upgraded early this morning with even additional strengthening expected throughout the day as Irene is now considered a major hurricane. Forecasts show a gradual turn to the northwest is expected by Wednesday, but the core of Irene will begin to affect the southeastern Bahamas today and the northwest Bahamas Thursday. The current forecast track shows Irene to move parallel with Florida's east coast, likely by that time already producing some sizable swells and rip currents, and then possibly making a landfall still as a major hurricane along the coastline of the Carolinas. It is possible for it to continue north and move into the Northeast as either a category one or two hurricane as early as next Monday. The past couple of forecast models runs have actually been pushing the track a little further to the east. A lot of just how far either west or east Irene will go depends upon how strong a couple cold fronts are that are forecast to move into the Northeast by this weekend. As of right now, it appears as if this is going to be a *major* problem for residents along the coast. It has been a very long time since a hurricane has hit the east coast. Tuesday morning's rainfall...which added up to over an inch for many...clear skies and calm winds overnight has lead to some pretty dense fog in many spots this morning. Visibility has dropped to about a quarter of a mile or less across northwest Illinois and near one mile every where else. Please use extra caution when driving this morning. Give yourself plenty of time to get where you need to go and leave plenty of distance between you and the car in front of you. Also, since it's the first day of school for many please watch for children waiting at bus stops! Visibility should begin to improve within the next hour or so. A lot of times when you get a strong complex of thunderstorms move over an area in the morning (this morning was an example), the lingering cloud cover makes it difficult for more storms to re-develop in the afternoon and evening. That's partially what's happening tonight across the Stateline. In addition to crediting the afternoon clouds to a quiet evening of weather, subsidence or "sinking air" in the wake of that departing upper-level disturbance (the one that bought us the heavy rains this morning) is preventing any vertical cloud growth. Therefore, I plan on removing that slight chance of storms from the forecast this evening. Although we have a cold front on its way to the area tomorrow, I think its late-morning passage will be too early for it to trigger thunderstorms. Therefore, I will continue to forecast a dry day tomorrow. 1:00pm Update: The complex of thunderstorms that moved through this morning continues to exit east early this afternoon. The associated cloud cover has helped to keep our atmosphere fairly stable while where the sunshine has been in full force out in Iowa the atmosphere is becoming more and more unstable. Temperatures right now are in the upper 60s where in Iowa the 70s and even upper 80s can be found. I am expecting our cloud cover to thin some as we go into this afternoon. There is a mid-level shortwave (or disturbance) moving through Wisconsin and that will continue to dive southeast through the afternoon and evening. The remainder of the afternoon will probably remain quiet, but some of our short term models are wanting to develop storms around 4pm or 5pm this evening. The area that we'll watch through the day will be across southwest Wisconsin and northeast Iowa; this is likely where the storms will initiate. The threat will be there for large hail and strong winds but an isolated tornado can't be ruled out, especially along the warm front. Although this threat may reside a little further to the northwest. As always, stay with us throughout the day and we'll continue to post updates right here. This image depicts the 850 mb moisture transport. Basically it's where moisture is being transported within the lower level of the atmosphere. The pink shaded area is generally associated with high rain events and notice how it covers northern Illinois and southern Wisconsin. The amount of moisture we have in the atmosphere remains fairly high to our northwest so as this upper level low moves through there could be more heavy rainfall on the way. (9:15:39 AM) nwsbot: LOT: De Kalb [Dekalb Co, IL] trained spotter reports FLOOD at 08:56 AM CDT -- ponding on some roadways up to an inch deep but deeper in some low lying areas. (9:15:39 AM) nwsbot: LOT: Rochelle [Ogle Co, IL] broadcast media reports HEAVY RAIN of M0.78 INCH at 09:00 AM CDT -- relayed from public. rainfall amount in last 40 minutes. Storms are now moving out of Winnebago county and have entered into Boone county extending southwest into Ogle and northern DeKalb county. One our weather weathers in Rochelle said it started raining there around 8:20am and the wind was beginning to pick up. 8:10am Update: The line of storms continue to move through the Rockford metro producing some pretty heavy rainfall. May even be a few spots of localized flooding. Visibility will also be reduced in the heavier rainfall. Lots of lightning will accompany this line. Once it passes, look for a steadier rain through mid-morning. 7:48am Update: Some of our weather watchers have reported some very heavy rainfall - especailly through Freeport (thanks Tony) as this line went through. 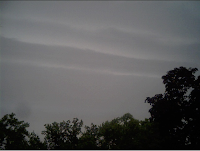 Another one of our weather watchers, Dee Hoffman, reported a shelf cloud on her way to Freeport. Storm is knocking on our doorstep at the station. Thunderstorms this morning continue to move east across northwest Illinois/southwest Wisconsin around 45 mph. While severe weather isn't anticipated with this line- heavy rainfall and gusty winds (around 40 mph) can be expected as these storms are now moving closer to Freeport, Shannon, Rock City, Ridott, German Valley and Milledgeville. The southern edge of the line, closer to the Quad Cities, may intensify some as it moves into more of an unstable airmass. This will likely clip residents in Whiteside county. A complex of thunderstorms is currently moving through southwest Wisconsin and northeast Iowa, just as I expected. These storms will continue to move east through this morning but run into a little more of a stable airmass from overnight. However, the low level jet should continue to pump moisture into these storms to keep them going through the morning hours. I anticipate the storms crossing the Mississippi River around 6am and should be within the Rockford area around 7am/7:30am. Once this passes this morning, more storms could develop later this afternoon as a warm front lifts north and interacts with an upper level disturbance. These storms would pose the greatest threat for severe weather later today. Hurricane Irene has strengthened significantly in the last 3 to 4 hours. At last report, it was a category-1 storm with 80 mph maximum sustained winds. It is now a category-2 storm on the Saffir-Simpson scale with maximum sustained winds of 100 mph. It has also slowed-down some, and is now moving to the west-northwest at 10 mph. Its current location is 130 miles east of Puerto Plata, Dominican Republic. A hurricane warning is in-effect for portions of the D.R., the Turks and Caicos Islands, and the central and southeastern Bahamas. Irene will mainly stay over open water over the next 24-hours. Unfortunately, this means additional strengthening is likely. High pressure will be in control for us today as skies remain partly cloudy and temperatures reach the low 80s. As the high moves east across the Ohio River Valley later this afternoon and evening winds will shift a little more to the southwest helping to bring in moisture from the gulf. An area of low pressure will move along the U.S/Canadian border Tuesday pulling a warm front through during tomorrow afternoon. I anticipate thunderstorms to develop across the northern Plains later this afternoon and evening and move east/southeast into the overnight across Minnesota, southwest Wisconsin and northeast Iowa. As this cluster of storms continues to move east we may get clipped along the southern edge Tuesday morning. Those storms will move across Lake Michigan by early afternoon. The warm front will help to increase the instability during the day and any outflow boundary that moves south from the storms in the morning could help trigger storms late in the afternoon and evening. Also moving through will be an upper level disturbance which could enhance the atmospheric lift. The storm threat will continue until early Wednesday afternoon until the main cold front passes. This will not only end the storm chance but also end the humidity expected for Tuesday and Wednesday. Should storms reach severe limits Tuesday, large hail and damaging winds would be the primary threats. First hurricane to impact the U.S.
As of 6am this morning what was Tropical Storm Irene has been upgraded Hurricane Irene. Currently a category one, Irene is heading for the southeastern Bahamas. Moving to the west/northwest around 14 mph, maximum sustained winds are around 80 mph. Preliminary reports indicated that widespread tree and powerline damage had occurred on Puerto Rico and more than 800,000 homes are without power on the island. Current forecast tracks take it through the Bahamas by early Thursday morning and then possibly along the southeastern coast of the U.S. by Friday morning. Some indications are suggesting that Irene could strengthen to a category two hurricane before making landfall. If Irene does in fact make landfall along Florida's eastern coast and then moves inland it could actually slow down our next cold front that is forecast to move through as early as Saturday. What would likely happen is the front would slow down and then stall until Irene moves back out into the Atlantic either by the end of the weekend or early next week. Of course, all of this depends on just how far north Irene will track. If it moves out over the Atlantic earlier than expected then there probably wouldn't be too much impact for us. Skies were mostly sunny on Sunday along with comfortable humidity, and a brisk northwesterly flow in the afternoon. The high was just a little cooler than the seasonal average at 80 degrees. The cumulus clouds that developed during the afternoon have dissipated after sunset leaving skies mostly clear. High pressure is located near Spencer, Iowa this evening, and it will provide clear skies, and light winds overnight dropping the temperature below average to near 57 degrees by daybreak Monday morning. The high will move slowly across Illinois on Monday providing the Land of Lincoln with fabulous weather...sunny skies, low humidity, light winds, and an afternoon high in the low 80's. (just about average for this time of year)... By evening on Monday the high will be moving into Ohio. A southerly air flow will develop across the Stateline and there will be a slight chance of showers and thunderstorms after midnight as disturbances over the plains states edge in from the west. There will be a good chance of showers and thunderstorms on Tuesday and Tuesday night with increasing moisture moving into the area from the south as warmer air moves into the region. On Wednesday it will be breezy and very warm in advance of a cold front that will drop through the area late in the day. With support lacking, there will just be a slight chance of showers and thunderstorms. The rest of the week will have near average temperatures, and plenty of sunshine. The cold front that generated a few severe thunderstorms with large hail and damaging winds along the Wisconsin state line on Saturday morning continues to slide off to the southeast. There were a few sprinkles and light rain showers early this evening as a disturbance moved out of Iowa toward northern Illinois. Skies have become partly cloudy, and temperatures will drop to the upper 50's by daybreak. Sunday will start off with mostly sunny skies, but some cumulus clouds will pop up by mid to late morning, and last through mid afternoon. There could be some isolated showers in the afternoon, mainly north of the Wisconsin line.. High temperatures will be in the upper 70's on Sunday. On Sunday night high pressure will slide from northwestern Iowa into northwestern Illinois. Skies will be mostly clear and temperatures will drop to near 57 degrees with light and variable winds. It will be mostly sunny on Monday as the high shifts slowly toward the east into northern Indiana by supper time. With the high to the east surface winds, will become light southerly on Monday night. There will be a slight chance of showers and thunderstorms on Monday night as the next disturbance moves toward northern Illinois from the plains states. By Tuesday the high will be over West Virginia, and a warm from will move across the area by afternoon scattering some showers and thunderstorms across the Stateline as it moves northeast. There will be a good chance of showers and thunderstorms on Tuesday night, and it will be warmer and more humid with an overnight low in the upper 60's. It will be breezy and very warm on Wednesday in advance of the next cold front. The Gulf of Mexico will not be feeding a direct line of moisture northward, so no widespread thunderstorm activity is expected. Highs on Wednesday will be around 86 degrees. Following the front high pressure will take complete control of area weather once again. It will be sunny on Thursday and Friday with high temperatures in the low 80's. Severe Thunderstorm Warning remains for McHenry countil until 10:30am. Heavy rainfall continues to fall over portions of DeKalb county. Also watching a few storms (capable of producing hail) moving through Lee county. These storms are now beginning to form into a line as they move eastward. Currently extending from southeast Wisconsin through McHenry county southwest into DeKalb and Lee counties. Heavy rainfall and wind will probably be of main concerns. PEA TO QUARTER SIZE HAIL. ACCUMULATED UP TO 6 INCHES. TIME ESTIMATED. QUARTER TO HALF DOLLAR SIZED HAIL. THE WIND DRIVEN HAIL SHREDDED LEAVES OFF OF THE TREES. 8:50am Update: The warned storm is moving out of Winnebago county, but will continue to affect Boone and McHenry counties. It appears as if this storm may have 'bowed' out a bit. Could be some very strong, possibly damaging winds, with this as it begins to move into Harvard. Severe Thunderstorm Warning remains until 9:15am. There are a few more storms moving through Stephenson county this morning. Further south from Byron to Oregon, storms will continue to move east through Ogle county. 8:35am Update: The storm is now moving into northern Boone county. 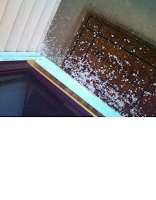 It's still showing the possibility of some decent sized hail. Heavy downpours will continue as this storm moves through. The storm moving through Winnebago county continue to show the possibility of large hail just south of the Rock/Winnebago county border. Rockton, Roscoe and even South Beloit you guys could be getting a very loud wake up call this morning! Please remain in doors until this storm has passed. 8:15am Update: Severe Thunderstorm Warning canceled for Green county, but continues for Rock. This storm is located just east of Durand and will continue to move to the east. Should be arriving in Rockton, Roscoe, Machesney Park and Loves Park fairly shortly. The storms are located near Brodhead and moving to the east around 30mph. Large hail, very gusty winds and even heavy downpours will be possible with this line as it moves through. First Hurricane of the Season? We've had a few tropical depressions as well as tropical storms move through the Atlantic, but none of them have made it to hurricane strength. That may change within the next week as there are a couple disturbances that are being watched out in the Atlantic and a couple of our models are developing a hurricane in the Gulf of Florida by next Friday. Certainly a lot can change within the next week but it's something to keep an eye. Is that rain in Texas? Could we see a repeat of last winter? Is This Weather Great, or What? Calling all Volunteer Weather Watchers! A Pattern Change This Week... A Nice Change! Most Humid July in At Least 30 Years!